A weekly newspaper’s annual Christmas Toy Appeal has seen 15,000 gifts given to underprivileged children. The Newham Recorder has run the appeal for 36 years in partnership with charity Community Links to ensure that each child in one of the UK’s poorest boroughs receives a present on Christmas morning. The Archant London title’s target has risen over the years and it managed to reach its aim of giving toys to 15,000 children last month, through donations of toys and money from readers. 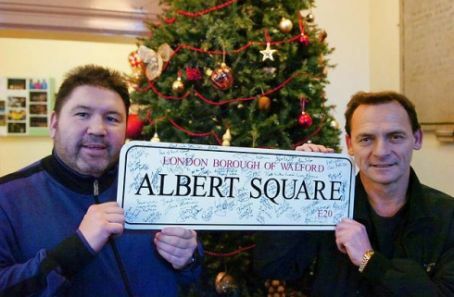 EastEnders actors Ricky Grover and Perry Fenwick, pictured below, also donated an Albert Square sign, which was autographed by the cast and auctioned off to buy more presents. Support also came from the first winner of BBC’s The Apprentice Tim Campbell, West Ham United Football Club, Tate & Lyle Sugars, along with other local businesses and schools. Editor Malcolm Starbrook said: “We’re delighted that there has been a fantastic amount of toys and gifts donated in such a short time. Former editor Colin Grainger, who left the Recorder in December after 40 years, began the Toy Appeal with Community Links founder Kevin Jenkins in 1976 and was recently awarded the Freedom of Community Links for his service to the charity.